When Tableau Desktop users publish a workbook or data source to a site on Tableau Server, they can select a project to publish it to. If they don’t specify a project, their content is published to the Default project. As an administrator, you can create projects to hold and organize related content resources, or to delegate content management. Content resources on Tableau Server are workbooks, views, and data sources, and the projects that hold them. The following image shows content within the top-level Operations project in the web authoring environment. The Operations project contains a few child projects (highlighted) and published workbooks. A project can also contain other content types, such as data sources and flows. They enable administrators to delegate content management to project leaders who work with the content more closely, without having to give them administrator access to site or server settings. Project leaders can create nested projects under their top-level project, enabling them to maintain their team’s content within a single hierarchy. Note: Project owners can delete top-level projects they own. They can make the site easier to navigate for self-service users. They segment the Tableau Server site into areas that give users access based on how they use the data published to those areas, or on the Tableau user group they work with. You can hide projects from groups who don’t need to use them, create a distinguishable project-naming scheme, and take advantage of project descriptions to clarify how to use the project. They enable you to track permissions effectively. You can create groups based on the level of content access users in the group need, and set default permissions on projects. This enables you to know exactly which capabilities new users get by default, and likewise which capabilities all users get when a new project is created. You, as a site or server administrator, can create top-level projects for each of your distinct Tableau teams. On each top-level project, you assign the Project Leader role to team leads, and change project ownership. Project leaders effectively are the content administrators, so it’s important that they understand how permissions work in Tableau, along with Tableau content management best practices. Each project leader takes over their project, creating the structure within the project that works for their team. That is, they can create child projects they need, based on how their team members collaborate and share data and reports. The benefit to you as the site administrator is that you can focus on system health. The benefit to your Tableau users is that people who know the best practices for working with Tableau and data can manage these things for their teams, without having to submit IT requests to change permissions or add projects. If you manage your own Tableau Server deployment, you can create as many sites as you want. However, for managing data and reports across your company, projects allow the flexibility you need to administer shared data and reports, and users who might belong to multiple groups. Many Tableau administrators configure projects as described in the previous section, to expose only what’s necessary to users who need to work with it. Projects work better than sites for evolving content from development to staging to production. Sites work well when content can remain completely separate during all phases, and there is little to no user overlap. A good (and common) example for using multiple sites is to create a site for each of multiple external clients, whose published content you manage as a consultant or vendor. Our own Tableau Online is an example of this on a large scale. Another example might be to use a separate site for sensitive content that you want only specific Human Resources or medical staff to use. As a server or site administrator, you can delegate administration of projects and their content, without exposing access to your site or server settings. You can do this by changing the ownership of a project or granting a group or user the Project Leader permissions role on a project. The project owner is always one individual user. By default, the user who creates a project is its owner. The project owner has administrative access to the project and content in it—including making someone else the owner and assigning Project Leader permissions. The Project Leader permissions role provides a way to allow multiple users administrative access to a project, its child projects, and all workbooks and data sources in those projects. A project leader does not have to be a project owner or administrator. In addition to server and site administrators, the full scope of Project Leader permissions is available to users with a Creator or Explorer (Can Publish) site role. In a multi-level project hierarchy, a user or group that is given the Project Leader permissions role to a project, at any level within the hierarchy, is implicitly given Project Leader access to all of that project’s child projects and their content items. To remove the Project Leader access, you must do so at the parent level in the hierarchy on which the ownership or role was explicitly assigned. Similarly, the owner of a project at any level has project leader access to all content in that project, as well as to any of its child projects, even if they do not own the child projects. Only a project owner or administrator can change ownership of a content resource, and this can be done regardless of whether the project permissions are locked at the top level. Project leaders and owners can perform the tasks in the following list, as can server or site administrators. Server or site administrators can create or delete top-level or nested projects anywhere on the site. Project owners and project leaders can create and delete child (nested) projects in projects they own, or on which they have Project Leader permissions. Project owners can change ownership of their projects. Both project owners and project leaders can assign the Project Leader permissions to groups or users. As a project leader or owner, if you assign the Project Leader permissions role to someone else, remember that full access to this role’s capabilities depends on the user’s site role, as specified earlier in this section. Set permissions for a project, as well as the child projects, workbooks, and data sources in it. Lock permissions to apply the top-level project’s default settings to all workbooks, data sources, and child projects and their content. Permissions can be modified only from the project on which they’re locked. In a locked project hierarchy, only the owner or project leader of the top-level project in the hierarchy can change permissions. Move workbooks and data sources to another project to which they have Project Leader or owner access. Moving the project can affect permissions. For information, see Add Projects and Move Content Into Them. Run, add, or remove extract refresh schedules. Tableau creates a Default project with every site. The Default project serves as a template for new top-level projects you create on the site. When you create a new top-level project, settings and permissions from the Default template are applied to the new project, including permissions set on content within the project. Note: Nested projects (projects you create within other projects) take the permissions set at their parent project, not the Default project. Which type of user gets what level of access for each new project. How you might need to modify permissions for each new project. 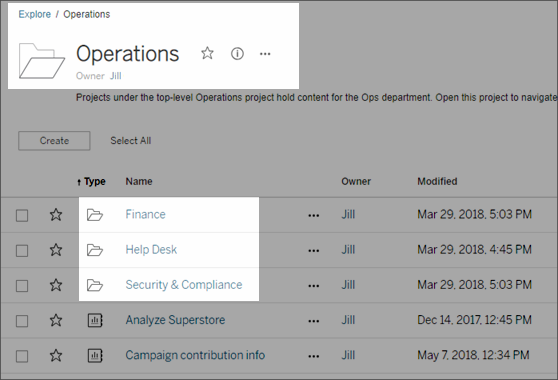 For more information, see Steps to coordinate projects and groups in the topic Configure Projects, Groups, and Permissions for Managed Self-Service. Administrators and project leaders can prevent users from changing the permissions for workbooks and data sources in a project hierarchy. For example, you can disable the option to set permissions during the publishing process, and prevent publishers and content owners from changing them after publishing. To do this, you lock content permissions to the project. For more information, see the links below.